I planted alot of tomatoes, they are all starting to produce. This plant is a Burpee Salsa, I have one in my backyard and one in front. I am not sure if this is a issue with the type of plant or what. To me it looks like sun scald , but it is ony happening on these plants. Some on back yard, some on front yard plant - I hope you can see it good. They look blotchy, and they have enough foliage to protect them, I moved branches to take this photo. Could this just be this particular seed? They just change colors in a weird way, should I eat them? Thanks for great site, I bookmarked it. So much info. Not sure what I will do, probably check into the deficiency , but it also had been very hot here. Thats why tomatoes have grown so well and so fast, but we have had some very hot days thrown in there as well. High 80's. Thanks again! 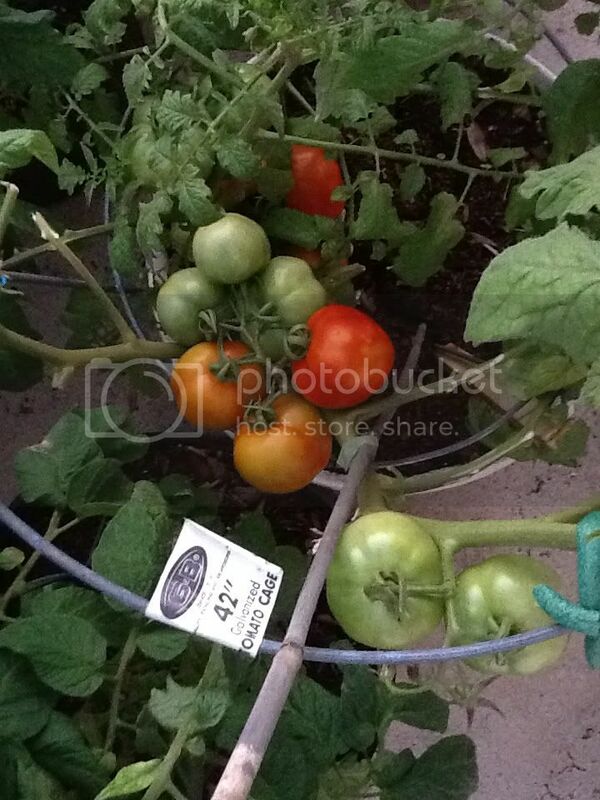 Avonnow wrote: I planted alot of tomatoes, they are all starting to produce. This plant is a Burpee Salsa, I have one in my backyard and one in front. I am not sure if this is a issue with the type of plant or what. To me it looks like sun scald , but it is ony happening on these plants. Some on back yard, some on front yard plant - I hope you can see it good. Wow, you got a real early start on those this year. My tomato plants are budding and have small fruit starting to develop but I'm still weeks behind what you have there. I bet they will still taste better than anything store bought, even with a bit of discoloration on the skins. Looking good there Sherry. The reddest tomato appears to have damage from a sucking/piercing bug like a shield bug or leaf footed bug. There will be a round area around the entry spot and usually several of these ringed areas will overlap. Just under the skin, the tomato flesh will look mealy and dry, where the bug extracted the juices and/or injected enzymes. Sometimes the spots will look irregular, from the bug moving and piercing, moving and piercing. It is pretty hard to tell from the photo, perhaps you just have uneven ripening. But I would definitely keep a lookout for various piercing bugs at work. hendi_alex wrote: The reddest tomato appears to have damage from a sucking/piercing bug like a shield bug or leaf footed bug. There will be a round area around the entry spot and usually several of these ringed areas will overlap. Just under the skin, the tomato flesh will look mealy and dry, where the bug extracted the juices and/or injected enzymes. Sometimes the spots will look irregular, from the bug moving and piercing, moving and piercing. Good call Alex. I have that problem late in the season with my tomato plants. I'll wake up one day and my plants will be covered in them and they do make the tomato look pretty nasty if not controlled quickly. I love tomatoes, but they come with their fair share of problems between diseases, fungi, and pests. I never knew about that bug, thanks I will look today. I think I may have bit off more then I can chew this year. I planted alot more tomatoes and they were all doing well, but it seems they all have different issues at the same item, and for me it takes alot of research to figure out what is wrong before the plant is destroyed. Thanks.